JURIS Conferences LLC is pleased to present its Fourteenth Annual Leading Arbitrators’ Symposium on the Conduct of International Arbitration. Leading international arbitrators and practitioners will discuss, in Socratic form, four topics of importance to counsel, arbitrators and business people who are involved in the resolution of international commercial disputes through arbitration. Leader: Hilary Heilbron, Independent Arbitrator, Brick Court Chambers. Brian Casey, Independent Arbitrator, Bay Street Chambers. Duarte Henriques, Partner, BCH Lawyers. Richard Hill, General Counsel-Litigation, Shell International Limited. Stefan Kröll, Independent Arbitrator and Professor, Bucerius Law School. Leader: Michael Young, Partner, Quinn Emanuel. Wulf Gordian Hauser, Partner, Hauser Partners. Lawrence Newman, Of Counsel, BakerMcKenzie. Stefan Riegler, Partner, Wolf Theiss. Nathalie Voser, Parter, Schellenberg Wittmer. Presentation of evidence by videoconference. Is this effective? The future? Leader: Sophie Nappert, Independent Arbitrator, 3 Verulam Buildings. Christian Alberti, Director and Assistant Vice President, International Centre for Dispute Resolution. Carlos S. Forbes, President-Arbitration and Mediation Center of the Chamber of Commerce Brazil Canada. Caroline Ming, Executive Director and General Counsel of the Swiss Chambers’ Arbitration Institution (SCAI). Alexis Mourre, President, International Court of Arbitration, International Chamber of Commerce. What are current Institutional efforts to increase the diversity of arbitrator appointments? Is it enough? What role, if any, do institutions currently play in monitoring the ethical conduct of arbitrators and counsel? Should they do more? Is it really satisfactory to rely on arbitrators to monitor conduct and ethics? In a system of peer- and party-appointed decision-makers, do arbitrators have the independence and latitude to take tough decisions re peers and colleagues (who might be fellow tribunal members, or suggest appointments, in other cases)? Is there any role for the institutions to provide a ‘safe space” for allegations of harassment? Should we be concerned that the IBA Guidelines on Party Representation appear to be significantly less popular than other IBA arbitration “soft law”? Regarding arbitrators’ duty to investigate and disclose conflicts – is there now a global standard in theory? In practice? Leader: Teresa Giovannini, Partner, LALIVE. Nikolaus Pitkowitz, Partner, Graf & Pitkowitz. Michael Polkinghorne, Partner, White & Case. Jacomijn van Haersolte-van Hof, Director General, London Court of International Arbitration. Available for full-time students with current student ID only; contact JURIS Conferences at: events@jurisconferences.com for special rate. Our Financial Aid Policy is available here. 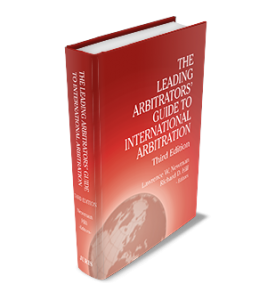 Arbitration, 3rd Edition (Lawrence W. Newman & Richard D. Hill, editors, a $195.00 value), refreshments at breaks, luncheon, and a drinks reception following the program. The fee does not include accommodations. Earn 7 NYS CLE credit hours (transitional and non-transitional): Areas of Professional Practice 5.5; Ethics and Professionalism 1.5. Rooms have been blocked for the nights of 25 March through 27 March, 2018 at the Grand Hotel Wien, Kaerntner Ring 9, A-1010 Vienna, Austria at a special conference rate of €249,00 through €299,00 per night (depending on room type) that includes all applicable taxes and fees. Reservations must be received by 26 February 2018 to receive the preferred conference rates. After 26 February 2018 rooms can be booked at conference rates based upon hotel availability. All arrangements are between the registrant and the hotel. Grant Hanessian is a Partner in the New York office of BakerMcKenzie. He serves as global co-chair of the firm’s International Arbitration Group. Mr. Hanessian is the U.S. alternate member of the ICC International Court of Arbitration in Paris, vice chairman of the Arbitration Committee of the U.S. Council for International Business (U.S. national committee of the ICC), and a member of the ICC’s Commission on Arbitration and its Task Forces on Arbitration Involving States or State Entities and on Financial Institutions and International Arbitration. In addition, Mr. Hanessian has more than 25 years of experience as counsel and arbitrator in disputes concerning contract, investment treaty, energy, construction, commodities, financial services, insurance, intellectual property and other matters before virtually all of the world’s major arbitration institutions. Carita Wallgren-Lindholm is a Helsinki based international arbitrator. Before founding her boutique firm in 2008 to focus on arbitration work, she spent 25 years in the law firm Roschier having commenced her legal practice in Paris in the early eighties. She has been been involved in more than 100 international arbitrations, institutional and ad hoc, mainly as arbitrator and mostly as chair. Institutions and rules include SCC, ICC, FAI, LCIA, JCAA, DIA, PCA and UNCITRAL, and seats Austria, Denmark, Finland, Germany, Iceland, Japan, the Netherlands, Sweden, Switzerland and the United Kingdom. Beginning January 1, 2018 Ms. Wallgren-Lindholm is the Chair of the ICC Commission on Arbitration and ADR. She is also a member of the ICC International Court of Arbitration (2012-), a member of the ICSID Panel of Conciliators (2007-) and serves on the Advisory Council of the Atlanta Center for International Arbitration and Mediation (ACIAM) (2015-) and ACIAM’s Arbitrators’ Council. Other arbitral institutions include the BVI IAC (2016-) and JAC (2014-). Christian “Chris” Alberti is the Director/AVP of the International Centre for Dispute Resolution (ICDR), the international division of the American Arbitration Association (AAA), in New York. He supervises the ICDR’s staff and center management activities and oversees hundreds of large complex multi-party arbitration and mediation covering all types of disputes and industries each year. Prior to joining the ICDR in 2005, Christian headed the Italian Desk of a mid-size law firm in Germany. Christian is the past President and Honorary Member of the Alumni Association of the Willem C. Vis International Commercial Arbitration Moot (MAA) and has represented the MAA as its NGO delegate at the UNCITRAL Working Group on Arbitration sessions. He is regularly invited to speak at international conferences and guest lectures at various law schools about international arbitration and mediation in the United States and abroad. He successfully coaches New York University’s Vis Moot Team since 2007 and its Foreign Direct Investment Moot Team since 2008. He is an associate of Pace University’s Institute of International Commercial Law, a founding member of the International Arbitration Club of New York as well as a member of various international ADR associations. Filip Boras is a Partner in Baker McKenzie’s Vienna office. He is an Austrian and New York qualified lawyer who frequently handles international arbitration cases related to Southeastern Europe. Mr. Boras focuses on international commercial and investment arbitration. He is experienced with the major institutional rules and procedures of the ICC, VIAC, ICSID, UNCITRAL and Swiss rules, as well as representing clients before ad hoc tribunals. Mr. Boras represents clients in energy, corporate, post-merger and acquisition disputes, as well as disputes arising out of investment treaties. Many of these disputes are related to countries of the former Yugoslavia, where his clients benefit from his region-specific experience and his being a native Serbo-Croatian. He is increasingly appointed to act as arbitrator. Brian Casey is an independent arbitrator who has over 38 years of experience in commercial dispute resolution. He is a former principal of Baker & McKenzie International and a former Chair of the firm’s North American litigation practice group. Mr. Casey is an adjunct professor at the University of Toronto Law School, a member of the board of directors of the American Arbitration Association and chair of the ICDR Canadian advisory committee. During his career, he has been retained as arbitrator, tribunal chair and counsel in numerous commercial arbitrations, both ad hoc and institutional under the auspices of the LCIA, the ICC and the AAA/ICDR. He has also acted in investor/state arbitrations under Chapter 111 of the NAFTA administered by ICSID and other investor/state arbitration arising out of bilateral investment treaties. Carlos S. Forbes is a Partner at Mundie Advogados. President of the Arbitration and Mediation Center of the Chamber of Commerce Brazil Canada – CAM-CCBC. Member of the Executive Council and former Vice-President of the Brazilian Arbitration Committee – CBAr. Member of the International Council for Commercial Arbitration – ICCA. Member of the International Bar Association – IBA. Member of the São Paulo Lawyers Association – AASP. Member of the Council and former President of the Advocacy Movement – MDA. Former Member of the Board of Directors of some of the most important Telecommunications and Energy Companies in Brazil. Arbitrator listed at the Arbitration and Mediation Center of the Chamber of Commerce Brazil Canada – CAM-CCBC, Mediation and Arbitration Chamber of the Paraná Commercial Association – Arbitac, Brazilian Arbitration Center – CBMA. Teresa Giovannini is a founding Partner of LALIVE in Switzerland specializing in international arbitration (including setting aside proceedings with Swiss Supreme Court), as well as art law. She has participated in more than 170 international arbitrations (115 as arbitrator, including 81 as presiding or sole arbitrator), either ad hoc, in particular UNCITRAL, or administered by various institutions including AAA/ICDR, ICC, ICHEIC, ICSID, LCIA, SCC, Chamber of Commerce of Milan, Chamber of Commerce of Venice and Swiss Chambers (Geneva, Zϋrich and Ticino. Her areas of specialization include disputes relating to procurement contracts, sales, license, agency, joint venture and shareholder agreements in a wide range of sectors, in particular infrastructure projects, aviation, transfer of technology, construction of turnkey factories, pharmaceuticals, insurance, luxury goods and arts. Duarte Henriques is a Partner at BCH Lawyers in Lisbon. Since 1990, he has acted as both counsel and arbitrator in a number of litigation and arbitration cases related to tech companies and tech disputes, investment disputes, banking & finance, corporate, commercial, distribution and construction disputes. Mr. Henriques serves as sole arbitrator, chair or member of tribunals in domestic and international arbitration proceedings, and as counsel in domestic and international arbitration proceedings, both institutional and ad hoc. He also provides services in domestic and international litigation, and regularly works with other international law firms in dispute resolution. As a partner of BCH, Mr. Henriques advises major banking and finance institutions, insurance companies, and technology/software solution providers in litigation and arbitration disputes. He specializes in Banking and Finance Law, Business & Commercial Law, Mergers and Acquisitions, Agency and distribution, Intellectual Property, and Third Party Funding. Richard Hill is General Counsel, Global Litigation of Shell International Limited. He leads a team of 130 people and is accountable for Shell’s litigation and arbitration matters globally. Mr. Hill is also a member of Shell’s legal leadership team. He is involved in many international arbitration and dispute resolution institutions, including as a director of the LCIA and a member of the ICC Commission on Arbitration. Mr. Hill practiced in the arbitration group of Fulbright & Jaworski (now Norton Rose Fulbright) in London and Hong Kong where he was founder and partner in charge of Fulbright’s Asia disputes practice. Vladimir Khvalei is a Partner in Baker McKenzie’s Moscow office. He heads the Firm’s CIS Dispute Resolution Practice Group. Mr. Khvalei serves as vice president of the ICC International Court of Arbitration, and is included in the list of arbitrators of the arbitration institutions in Austria, Belarus, Dubai, Hong Kong, Kazakhstan and Russia. He handles international arbitration cases as a party counsel and arbitrator, particularly with respect to the arbitration rules of the ICAC, ICC, SCC and UNCITRAL. Mr. Khvalei represented one of the world’s largest oil companies in complex multi-jurisdictional disputes in Kazakhstan, Netherlands and Sweden in a case involving two billion dollars (USD). Stefan Kröll is an independent international arbitrator. He is a Director of the Wilhem C. Vis Arbitration Moot in Vienna. Mr. Kröll is an honorary professor at the Bucerius Law School and regularly gives lectures and talks at universities and arbitral institutions. He regularly lectures in the master program of the University of California, Davis, and has a Visiting Readership at the School of International Arbitration, University of London. Mr. Kröll is one of Germany’s national correspondents at UNCITRAL and has been retained by UNCITRAL as one of three experts to prepare the DIGEST on the UNCITRAL Model Law on International Commercial Arbitration. Annette Magnusson is Secretary General of the Arbitration Institute of the Stockholm Chamber of Commerce (SCC) and General Counsel of the Stockholm Chamber of Commerce. She joined SCC from Mannheimer Swartling Advokatbyrå (Stockholm) in 2010. At Mannheimer Swartling she was involved in international arbitration and strategic issues involving the dispute resolution practice. Previously she headed strategic planning of knowledge management at Baker & McKenzie in Sweden. She was SCC legal counsel and later SCC Deputy Secretary General from 1998 to 2005. Her role as counsel included frequent contacts with the Swedish legislator in matters of commercial law. She earned her LLM at the Stockholm University in 1998 and her BA/BSc at the University of Gothenburg in 1991. She is a frequent speaker on international arbitration and the development of legal services on a global level. Caroline Ming is the Executive Director and General Counsel of the Swiss Chambers’ Arbitration Institution (SCAI). She acquired her experience in a variety of environments, such as the Geneva Superior Administrative Court, as an associate at Python & Peter Geneva and Bär & Karrer Zurich, and through her eight years as international legal counsel for the SGS worldwide group of inspection companies. In her capacity as in-house legal counsel, she has assisted SGS and its affiliates in their contract and claims negotiations and represented them in mediation, commercial and investment arbitration, as well as in litigation in various jurisdictions and under various dispute resolution institutions, notably SCAI, ICC, ICSID and LMAA. Given her strong business and risk management acumen, Ms. Ming has also been managing business development projects for the SGS Minerals Service team and, in 2013, was promoted to join the SGS Strategic Transformation team and took over the management of the SGS Global Standard Inspection Reporting Program. Ms. Ming is a member of the board of a hotel management group, acts as co-President of the Association of International Business Lawyers in Geneva region (www.aibl.ch) and is the Country Representative for Switzerland of the European Chapter of the Association of Corporate Counsel (www.acc.com). Alexis Mourre is the President of the ICC International Court of Arbitration since July 1, 2015 and was Vice-President of the Court from 2009-2015. He has served as parties’ counsel, President of the Tribunal, Co-Arbitrator, Sole Arbitrator or Expert in more than 250 international arbitration, both ad hoc and before most international arbitral institutions (ICC, ICSID, ICDR, SIAC, SCC, DIAC, VIAC, etc.). Mr. Mourre established his own arbitration practice in May 2015 after having founded Castaldi Mourre & Partners in 1996, now a 35 lawyer firm specializing in arbitration and dispute resolution. He is the author of numerous books and publications in the field of International Business Law, Private International Law and Arbitration Law. Mr. Mourre is founder and former editor in chief of Les Cahiers de l’Arbitrage – The Paris Journal of International Arbitration, a leading French publication in the field of Arbitration. He was Vice President of the ICC Institute of World Business Law from 2011 to 2015, and served as co-chair of the IBA Arbitration Committee (2012-2013), LCIA Court member (2012-2015) and Council member of the Milan International Chamber of Arbitration (2006-2014). Mr. Mourre is the founder and former president of Paris Place d’Arbitrage/Paris the Home of International Arbitration. Sophie Nappert is an independent arbitrator based in London. Before becoming a full-time arbitrator, she was Head of International Arbitration at a global law firm. She is trained and has practiced in both civil law and common law jurisdictions. Ms. Nappert is the peer-nominated Moderator of OGEMID, the online discussion forum on current issues of international investment law, economic law and arbitration. Her areas of expertise include, energy and natural resources, infrastructure, hotel and leisure, pharmaceuticals, telecoms , joint ventures, concession agreements, emerging economies and notably Russia, Kazakhstan and the Caspian region, the Energy Charter Treaty, investment treaty disputes, investment law and EU law, and disputes against State parties. Lawrence Newman is Of Counsel in Baker McKenzie’s New York office. He practices mainly in the areas of international litigation and arbitration and has represented clients in courts and before arbitration tribunals. Mr. Newman has served as arbitrator in cases under the rules of the AAA/ICDR and the International Chamber of Commerce. He is a co-editor of The Leading Arbitrators’ Guide to International Arbitration which is the basis of the Leading Arbitrators Symposium on the Conduct of International Arbitration. Nikolaus Pitkowitz is founding Partner and head of dispute resolution and real estate at Graf & Pitkowitz. His practice has always been international. Dr. Pitkowitz is considered one of the preeminent Austrian dispute resolution practitioners. He acted as counsel and arbitrator in a multitude of international arbitrations, including several high profile disputes, most notably as counsel in the largest ever pending Austrian arbitration (a multibillion telecom dispute). Dr. Pitkowitz is also active as counsel in significant real estate projects and currently serves as chair of the IBA Real Estate Section, the world’s largest association of real estate practitioners. Michael Polkinghorne is a Partner in the Paris office of White & Case where he heads the office’s arbitration group and is joint-head of the firm’s oil and gas practice. He focuses on advising clients on arbitration and litigation matters, notably in the areas of energy, telecommunications, project finance and infrastructure. Mr. Polkinghorne has served as counsel and arbitrator in numerous arbitrations conducted under most major institution rules, helping to resolve disputes for a range of significant commercial and sovereign clients. He is the former Australian member of the International Court of Arbitration of the ICC, and a current member of the ICC Task Force on arbitrations involving state entities. Mr. Polkinghorne has handled disputes arising in many different countries, and has significant experience in the area of foreign direct investment and acting for and against states. Stefan Riegler is a Partner in the Vienna office of Wolf Theiss. He will lead the arbitration group and further expand its multijurisdictional arbitral practice. Mr. Riegler specializes in representing companies involved in commercial legal disputes before arbitral tribunals. Formerly, Mr. Riegler was a Partner in the Vienna office of BakerMcKenzie where he helped to build up their arbitration practice. The focus of his arbitration practice includes post-M&A, banking, competition, insolvency and energy. He is recognized as a leading arbitration expert in Austria. Laurence Shore is a Partner in the Milan office of BonelliErede. He is the Team Leader of the International Arbitration Focus Team. Mr. Shore has expertise in international arbitration, as counsel and arbitrator (under the ICC, LCIA, ICDR, ICSID, Cairo Regional Center for International Commercial Arbitration, AAA-Commercial and UNCITRAL rules), international dispute resolution, litigation before USA courts, IP and Business and Human Rights. He focuses his practice in these key sectors, energy, construction, telecommunications, mining, healthcare, maritime and finance. Prior to joining BonelliErede, Mr. Shore was a partner in Herbert Smith Freehills in New York. Nathalie Voser is a Partner in Schellenberg Wittmer’s Dispute Resolution Group in Zurich. She has acted as counsel and arbitrator in a vast number of cases and has advised clients involved in complex multi-jurisdictional disputes before state courts. Her areas of specialization include general contract law and international procedural law such as (pre-trial) attachment and recognition o foreign judgments and arbitral awards. Prof. Dr. Voser focuses on contracts regarding construction, civil engineering and energy related projects, research and development distribution and license agreements, joint ventures as well as mergers and acquisitions. She is well known for her expertise in the construction, power production, pharmaceutical and automotive industries. Michael Young is a Partner in Quinn Emanuel’s Paris office. He specializes in international arbitration and is one of the leading practitioners in the market worldwide. Mr. Young joined Quinn Emanuel in 2017 from Allen & Overy (where he was Global Co-Head of their arbitration practice. He has advised and represented international clients in countless arbitrations throughout the world, both ad hoc and under each of the major institutional rules. Although experienced across all industry and market sectors, he has a specific focus on energy, construction and infrastructure disputes Those disputes have arisen worldwide, but with a particular focus on Africa (both North and Sub-Saharan, North America, Asia and the Middle East. He is a leading advocate – regularly arguing cases before arbitral tribunals and experts – and has been on the Executive Committee of the Federation for International Arbitration since its inception. Mr. Young frequently sits as an arbitrator. Thursday, September 28, 2017. Hogan Lovells - 875 Third Avenue, New York, New York.